Let’s continue looking at more of the key puppy supplies to have when you bring your puppy home. Before welcoming your puppy into your home, you’ll want to purchase these essential puppy supplies ahead of time so you have everything you need. You will want to start working on simple commands with your puppy right away, and puppy training treats can really help. Positive reinforcement and rewarding them with training treats for good behavior are incredibly effective training methods, especially during their first few months. Start using their name frequently, and begin adding in simple commands like “come” and “sit.” Use your clicker and training treats as you begin introducing these commands to reward them. Treats and clicks will help when they start going to the door and asking to go outside when they need to use the bathroom, which can make potty training much smoother. Potty training starts the minute your puppy walks in the door. Puppies have very small bladders which means they go to the bathroom a lot. They may need to go out every 20 to 30 minutes for the first few weeks. For some, using pee pee pads during potty training can make the entire process much easier. Having potty training pads on hand isn’t a bad idea for the first few weeks because you can place them near doors as your pup familiarizes themself with asking to go outside to go potty. Having these right at the door can cut down on accidents happening on your carpet, rugs, and flooring. You’ll also want to have a stockpile of carpet and floor cleaner to clean up messes — there will be a lot of them at first. Nature’s Miracle Dog Stain Remover and Resolve Pet Spray are both great for cleaning up puppy pee and poop. Have plenty of paper towels, old rags, and plastic bags handy for cleaning up messes quickly. The important thing is to thoroughly clean accidents right away, as leaving them uncleaned, or not cleaning them up completely can lead to more accidents in the same spot. Puppies are chew-machines — they will gnaw on anything and everything. While this is completely normal behavior, it can be one of the biggest stressors on new puppy parents. Puppies explore everything with their noses and mouths. Not only do they investigate new and exciting objects with their mouths, but chewing alleviates teething discomfort. What’s more, puppies often chew simply because they are bored. Having a lot of chewing options for your pup (other than your hands, feet, and valuables) is a great way to keep them busy while also helping ease their discomfort from teething. KONG makes virtually indestructible rubber chew toys that provide puppies with the resistance they desire when chewing. Nylabones are also incredibly durable, yet chewy and safe for your puppy’s teeth. These are just a few more puppy essentials to have on hand when you bring your new furry family member home. 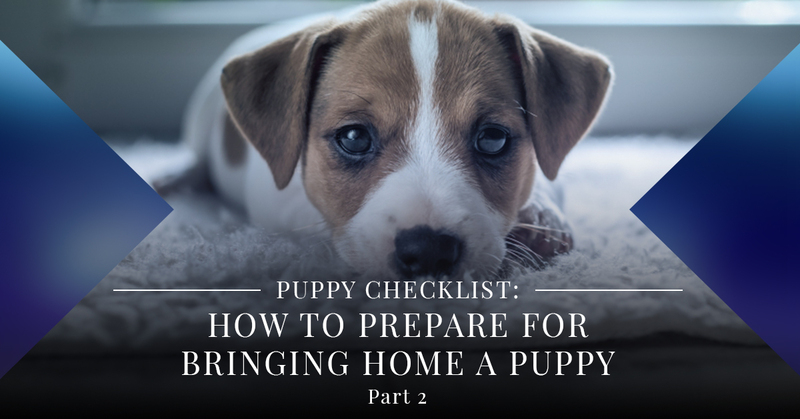 Join us for part three as we continue looking at ways to prepare your life and your home for a puppy. If you have any questions about puppy training, puppy nutrition, or would like to schedule your puppy for an exam and vaccinations, call us at Eagle Animal Hospital and Pet Resort, Kansas City’s trusted, fear-free veterinarian. We can provide your pup with his or her core vaccines, including DAPP (Distemper, Adenovirus, Parainfluenza), Leptospirosis, Rabies, and Bordetella, all of which we will explain in further detail in a future blog post. Thank you for reading!